Preschool Playbook: Continuing the Wonder of "Me"
We are still focusing on our Me unit, being all you can be, the best you can be. Mrs. D is a big advocate of using books to help compliment our idea for the day. 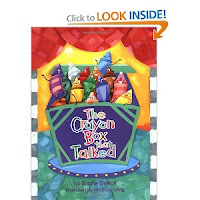 Wednesday we read the story, "The Crayon Box That Talked," by Shane DeRolf. This is a story about a box of crayons not getting along too well, thinking they are the best, and not working together. The crayons are then bought by a child who uses all the crayons in the box to create a beautiful picture. I thought it was a good example of the wonderful things we can do together when we all use our special qualities. We talked about how we are all different, but we need to have all the differences to create wonder in our world. Our craft for the day was to paint a crayon. I had cut out a crayon shape for each child then let them decide what their favorite color was to paint the crayon. On the first day of class we had taken a picture of each child. I had the pictures printed out for Friday, when the crayons would be dry. Mrs. M cut the pictures into a circle shape. The children then glued the pictures and some black line decorations on the crayon to finish the craft. I then hung them up around the room. They look so great! We also finished our colors this week. On Wednesday we did the colors blue, green, and black. Then on Friday we finished up with brown, white, and purple. I'm going crazy for this idea! My kids will love creating these (they always love painting assignments)and now I'm excited to share this with them. Where do you find your classroom supplies? Thanks so much for reading. We got most of our classroom supplies from Discount School Supply. Everything you see in this post is hand made. You enjoy your year as well.